US Power Forward John Smith will finish the season with WBC Wels in D1 Austria. The former two-time NCAA 2 Player of the Year had started the 2010/11 season with the EiffelTowers in Holland, but an early injury set him back and John was looking for a fresh start after the Christmas break. John arrived in Wels and is looking forward to help his team for the remainder of the season and in the Play-Offs. The midweek game series had a second upset after the winless Rotterdam teams win. The Eiffel Towers from Den Bosch broke the 13 game winningstreak of Gasterra Flames from Groningen beating them 74 -59. Eiffel Towers had been struggling the last couple of games, but came back strong this game keeping the Flames to only 59 points. Eiffel Towers was shooting the ball very well in the first half and also put a lot of defensive pressure on the Groningen team which resulted in a 16 point lead at half time. In the third quarter it looked like Gasterra Flames came back into the game closing the gap to 7 points. In the fourth quarter Den Bosch didnt get into any trouble anymore and receiving the honour to break the winning streak of the dutch champions. Scorers1st client John Smith is slowly returning into the line up of coach Raoul Korner after being out for several weeks with an injury posting 3 points and 8 rebounds in his third game after his injury. Every team played in the second round of the Dutch Basketball League. And so lots of Scorers1st clients were in action. Last years final of the play offs was scheduled in this round of the Dutch Basketball League. Due to Euroleague commitments Gasterra Flames didnt play in the first weekend of the Dutch Basketball League. Last years losing finalist Bergen op Zoom was the opponent of the Gasterra Flames this weekend. The champions from Groningen just changed two spots on their roster. They added Scorers1st client Henry Bekkering and fromer Eisbaer John Turek to their winning squad. In the first quarter the Flames dominated the court ending the quarter 15 -24. In the second quarter the Giants rallied back closing the half 33 -37. In the third quarter the teams balanced the score, while in the fourth quarter Groningen put the gap on the board to finish the game with a 81 -88 final score. Leading the WCAA Giants was Jesse Kimbrough with 17 points and for Gasterra Flames Jason Ellis 16 points and Scorers1st client Henry Bekkering had a great defensive effort with 3 steals and also added 5 points in the first win of Gasterra Flames. After the Matrixx played an overtime game in the first round of the Dutch Basketball League and lost it, they got a second chance this weekend in the game against De Friesland Aris. In their homegym the Horstacker they pulled out a win with a shot in the buzzer. For the Aris team Todd Brown and Gerad Punch had a huge impact on the game. Todd because of his dominance on the court posting 23 points, 6 steals and 4 rebounds. Scorers1st client Gerad Punch added 15 points and 11 rebounds. For the Matrixx side Brian Laing added 24 points and Scorers1st talent Elias Bish added 6 points, 2 assists and 2 steals. After Zorg en Zekerheid Leiden had an overtime win in the first round of the Dutch Basketball League and BSW lost with a big difference last week, most people expected an easy win for Zorg en Zekerheid Leiden. How different would things end up after the last horn had blown. Leiden really had no chance against a really motivated BSW Weert with an exploded Glen Stokes who scored 28 points. Scorers1st client Ross Bekkering played only 22 minutes due to foul trouble but ended up with 14 points and 10 rebounds anyway. These two teams are from the two biggest cities in Holland, but both teams have very young teams. Rotterdam won 3 of the four quarters, but couldnt recover from the desastreus second quarter when they only scored 4 points. Three Scorers1st clients where playing in this game. For Amsterdam Jessey Voorn added 18 and Sergio de Randamie ended the game with 6 points and 3 rebounds. On the Rotterdam side Patrick Hilliman scored 22 points, Robbie Sihota 8 points and 5 rebounds and EJ Kusnyer ended up with 7 points. After an impressive win in the first game of the season much was expected from the Landstede Zwolle team. However the defensive pressure of the composed Eiffel Towers team was too much for the team from Zwolle. The 53 points that were on the scoreboard for Landstede at the end of the game showcased which an defensive pressure Zwolle had to deal with. Because of the injury of Scorers1st client John Smith, the young big man of Eiffel Towers had to step up and so they did. 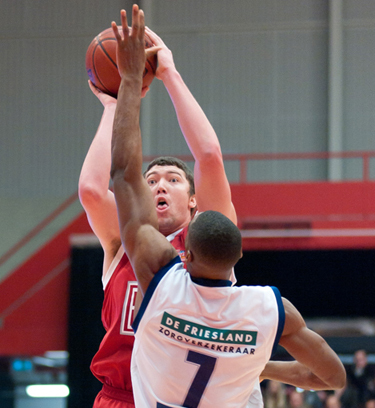 Dutch national team player Stefan Wessels dominated scoring wise adding 22 points. This weekend the dutch basketball league started. This year 10 teams will compete in the dutch basketball league. The Gasterra Flames are the reigning champions and are looking for repeating their championship the upcoming season. However they didnt play this weekend since they were playing in Russia on friday in the qualification round of the Euroleague. This year there 8 of the 10 teams in the Dutch Basketball League will have one or more Scorers1st clients aboard. The most supsense game was the game of Zorg en Zekerheid Leiden against Matrixx playing for Kids Rights. In this game we saw Scorers1st clients Ross Bekkering and Elias Bish battle each other in an overtime game. Last year this teams ended up at the 4th and 5th spot of the regular season and eventhough both teams changed their teams drastically, everybody expected a close game. In a nervous first half both team had trouble finding the basket in a consistent way which led to a half time score of 28 -27. In the fourth quarter it seemed that Zorg En Zekerheid Leiden would close the game when they took a 11 point lead. However Magixx fought back and in a tactical last 30 seconds they pulled out the overtime. In the overtime Scorers1s client Ross Bekkering dominated the paint and after a fast break power dunk smashed the hopes of the team from Nijmegen. Ross Bekkering contributed18 points and 13 rebounds and 2 blocks in this game. This game was the game between de Friesland Aris, which was the biggest upset in the past season, when they reached the semi finals of the play-offs and the finalist of last year WCAA Giants. WCAA Giants couldnt use Tyler Tiedeman in this game because of an injury. De Friesland Aris had some injuries during the week, but the medical staff made sure during this week that everybody was ready to play. Scorers1st client Todd Brown had a good game posting 23 points, 2 steals and 3 assists. Gerad Punch made an important threepointer at the end of the game contributing 7 points to the first win of the season of de Friesland Aris. The young Amsterdam team had a rough start in week 1 of the Dutch Basketball League. The Amsterdam team consists of young talented players, where the Eiffel Towers team has a couple of dutch national teamplayers aboard who have wide international experience. In the first couple of minutes Scorers1st client John Smith got injured and he will be out for several weeks. On the other side Jessy Voorn and Scorers1st client Sergio de Randamie tried to help their team to leave everything out on the floor in this difficult game. Jessey Voorn finished with 17 points and Sergio de Randamie with a double double 10 points/10 rebounds. On the Eiffel Tower side it was Rogier Jansen netted 16 points. Landstede Zwolle opened their season in their new gym with more spectators than ever have attended a basketballgame in Zwolle. The new gym is a beautiful and should help Landstede Zwolle to get better exposure and more spectators than in the past. On this openingday Scorers1st client Arno Bunnig had to stay sidelined because of a injury. However thhe Zwolle team was so motivated that they blew BSW Weert away. The team of Herman van den Belt played composed and organised which let to a celebration on court after the game was over. Harry Marshall netted 26 for Zwolle and Junior Hairston 16 for BSW Weert. John Smith signed his part of the deal with Eiffel Towers yesterday signing a one year contract. The MVP and defensive player of the year in Portugals highest league is a terrific inside player who knows how to use his body very well in the paint. He is a real force inside that possesses very good low post moves and a solid shot from mid range. 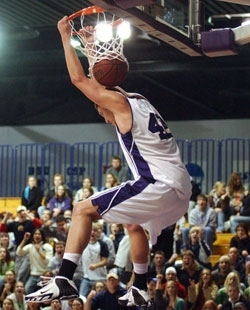 Last season he proved why he was voted player of the year twice in NCAA II playing for Winona State and why he managed to win to national championships in his collegiate career. In Portugal he posted 18,3 ppg, 9,9 rpg and 1,9 bpg. His defensive ability combined with his offensive threat is what makes him the special and complete player he is. Technical manager Jos Frederiks is happy with the signing of John Smith: “We were looking for a big man that we can put on the floor together with Marcel Aarts, but also with Stefan Wessels and Jeroen vd List. Smith brings us scoringability and reboundingpower”.